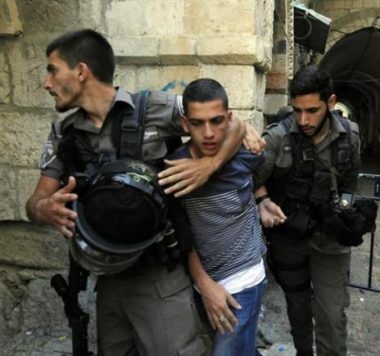 Israeli soldiers abducted, on Saturday evening and Sunday at dawn, seven Palestinians from in occupied East Jerusalem, including five children, between the ages of 12 and 15, who were taken prisoner in Silwan town, south of the Al-Aqsa Mosque, and in the Old City. Media sources said dozens of soldiers invaded and searched homes in Silwan, and abducted Abdul-Rahman Shweiki, 14, Qussai Husam Zeitoun, 13, Omran Mofeed Mansour, 15, Mahdi Mofeed Mansour, 12, and Khaled Waleed Abu Mayyala, 20. On Saturday evening, the soldiers abducted Amir Abu Mfarreh, 15, while walking close to his home in at-Tour neighborhood, overlooking the Old City. Furthermore, the soldiers abducted a young man at a military roadblock, near the main entrance of Shu’fat refugee camp, in the center of Jerusalem.